The universe is an immensely vast place, a place so0 big that is difficult for the mind to grasp. There are a hundred billion galaxies in the observable sky, each one containing a hundred billion suns, each sun on average as massive our own, which weighs 1,400 billion billion billion tons. The light from the most distant galaxies that we can see has been crossing the universe for more than 12 billion years. Two weeks ago, I lay on my back on a dark, clear night, mesmerised by a sky flooded with stars and galaxies of stars, agog at the enormity of the gorgeous stage on which we live our lives. This huge cosmos had a beginning, and, wonderfully, though it happened more than 13 billion years ago, the universe is awash with the literal echo of the Big Bang. How can the Big Bang be a literal echo of a sound? - well, see below. The cosmic microwave background is the glow which permeates the universe and which is a remnant of the Big Bang. Immediately after the Big Bang, the universe was immensely dense and hot. Energy and matter at these temperatures are coupled - light cannot propagate freely - in other words, the universe was opaque to light. As the universe cooled, it reached a temperature where electrons, protons and neutrons combined to form neutral atoms, mainly of hydrogen and helium. At this time (the point in time is called 'decoupling') the universe became transparent and photons (ie light) were able to travel freely across the universe. These photons, that have been in transit for more than thirteen and a half billion years, are what we observe when we measure the cosmic microwave background today. There are several key characteristics of the CMB, but one is extremely important: it is very uniform - in whatever direction we look the CMB appears to have the same intensity within one part in 10,000. But it is not perfectly uniform - there are slight non-uniformities in the CMB and these non-uniformities (called anisotropies) carry a huge amount of information about the state of the universe, both at the time of decoupling and later. The anisotropies in the CMB arise from random density fluctuations in the early universe, that eventually led, under the influence of gravity, to the structure - stars, galaxies and galaxy clusters and super clusters - that we see in the universe today. The state of matter-energy at the time of last scattering, that is, at the time when energy decoupled from matter, and light became free to flow across the universe, was a baryon-photon (matter-light) plasma that behaved as a fluid. Acoustic oscillations, which were, in effect, a literal vast bell-ringing of the universe, permeated the matter-light plasma - the universe rang like a bell. The greatest amplitude in the CMB temperature power spectrum corresponds to a specific spatial scale at the time of decoupling and occurred where the frequency of the primordial fundamental bell-note corresponded exactly to a single compression cycle of the plasma between the time of Big Bang and the time of last scattering. This results in the first (and major) peak in the CMB temperature power spectrum, predicted to be just where we see it in the CMB spectrum. In other words the fundamental musical note of the universe was captured in the CMB and we can see it today - all of this was predicted before the CMB spectrum was measured. The job of the WMAP (Wilkinson Microwave Anisotropy Probe) satellite is to measure the anisotropies in the CMB. 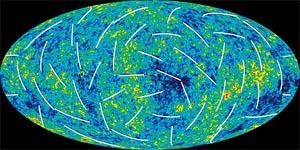 It has been gathering data on the CMB for several years. Conclusions based on one year of data were published in 2003 (1), (2), (3) , and these conclusions very strongly supported the concordance model of cosmology. The analysed data supported a universe that is 13.7 billion years old, in which decoupling occurred at red shift (z) = 1089 or 379,000 years after Big Bang. It suggested that reionisation of the galactic medium by the first stars to form occurred at z~17 or 400 million years after Big Bang which was surprisingly early. It supported a spectral index for the CMB, ns = 1, which is equivalent to perfect scale invariance in the CMB aniotropies - in other words, it was consistent with the primordial fluctuations in the CMB being fractal - the same power at all scales. Early cosmological theory predicted a spectral index = 1; however, inflationary theory which was introduced to explain the flatness and horizon problems predicts a spectral index a little less than unity. The third year results from WMAP have just been published. The third year data, being based on a much bigger data set, remove random error from the data and improve the precision of the conclusions. The major difference between the first year and the third year data is that there is an accurate all-sky polarisation map which gives additional information about the cosmos. The new data support the concordance model of cosmology. They also support subtle adjustments of the parameters compared to the first year findings that, generally, bring them into better coincidence with the theoretical position. For example, the optical depth of the universe was considerably lower than estimated from the first year data, and this means that the best estimate for ns is now about 0.95 which is more compatible with inflation. Reionisation of the galactic medium by the first stars is now supported at z=10 or about a billion years after Big Bang which is, along with the revised figure for ns, a much closer match to theoretical predictions and not as surprisingly early as the first year data suggested. The third year data are in agreement with a model of the universe that is also in agreement with many other astronomical observations, such as deep galactic surveys. They support a model of the universe that is homogeneous (the same throughout space), isotropic ( the same in all directions), and spatially flat. Matter-energy consists of ordinary matter, radiation and dark matter. In the early universe, fluctuations are random gaussian (the probability of finding a particular density in the early universe follows a random gaussian distribution), adiabatic (ie, the matter and energy fluctuations are in phase and there are no entropy fluctuations) and scale invariant (fluctuations occur equally at all scales - they are fractal). The data is consistent with a dark energy component which is responsible for the accelerating expansion of the universe and which makes the critical density of the universe near unity. Dark energy has an equation of state w near to -1. Dark matter is non-baryonic and ns is less than unity. The data neither support nor rule out the presence of gravity waves. The polarisation data are consistent with tensor modes, which are the signature of perturbations resulting from gravity modes but cannot, yet, definitively support them. Otherwise, the concordance between the standard model and the WMAP observations is uncanny - we are becoming more confident that the standard Big Bang with inflation model is correct.